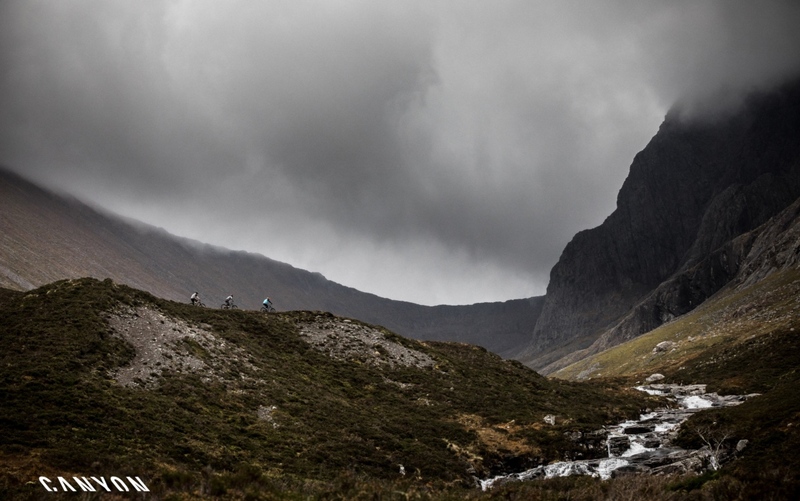 What makes a trail bike fun? 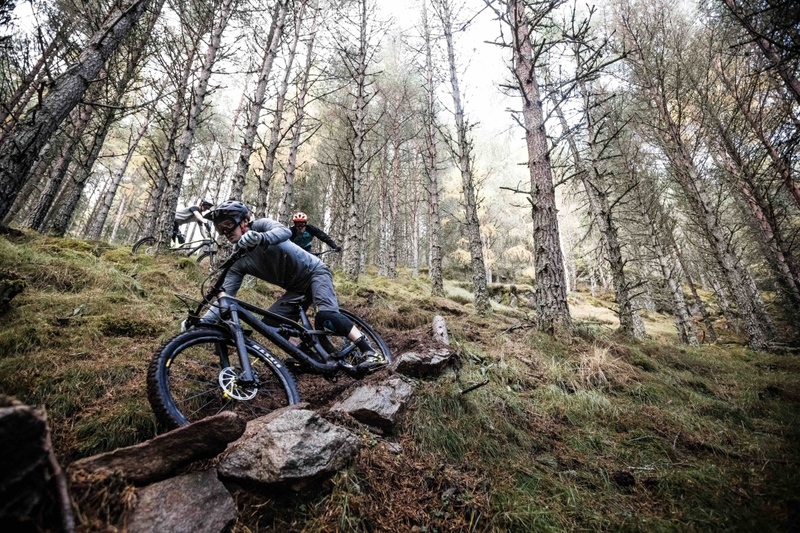 Taking cues from its top pro riders, the Canyon development team set out to find that right mix of traction, control, handling, and playfulness when undertaking a full redesign of its already popular Spectral model. The goal was to create a bike that begs to be thrown through corners and fly down trail, while also providing plenty of pedaling platform and being easy to service. From suspension and geometry to wheel and tire size, the new Spectral sought to find that ideal balance. The end result from the German direct-to-consumer seller carried over much of what made the original Canyon Spectral so loved. Wheelsize stays at 27.5, but with the addition of boost spacing, there’s now room for up to 2.6 tires. 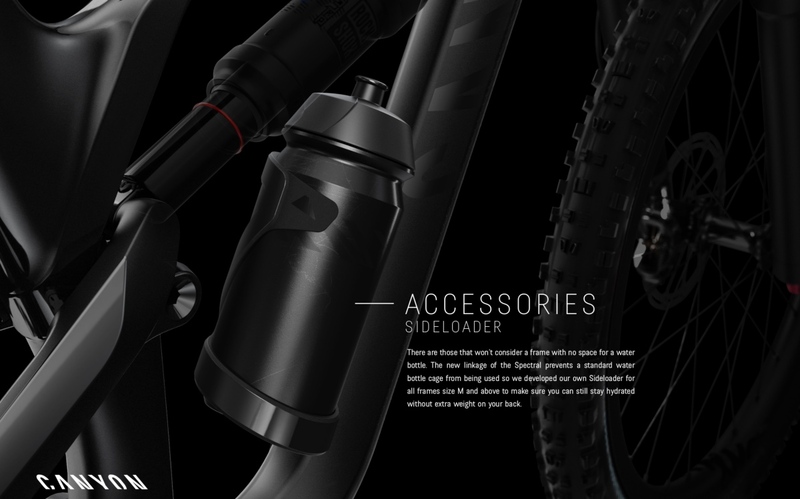 Travel also remains at 140mm rear and 150mm up front, but the bike’s linkage has changed, now taking inspiration from Canyon’s long travel Sender DH bike. 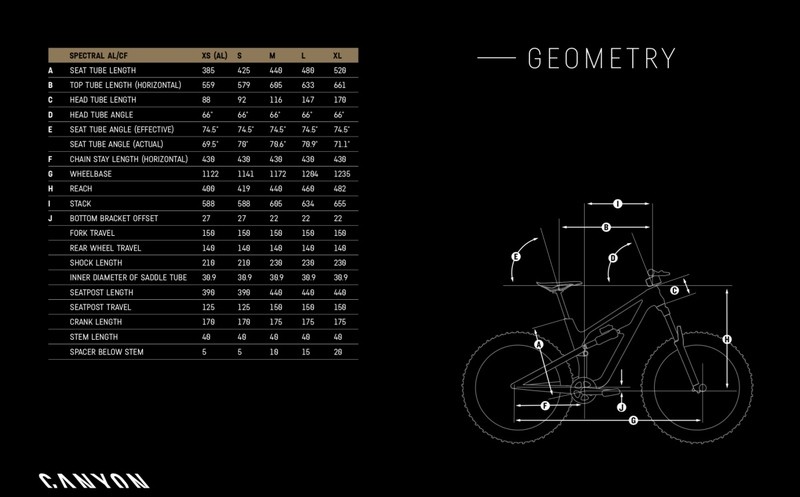 Head angle across the board is 66 degrees, effective seat tube angle is 74.5, chainstay length is 430mm, and the bikes are available in XS-XL frames sizes (with the XS only coming in alloy). 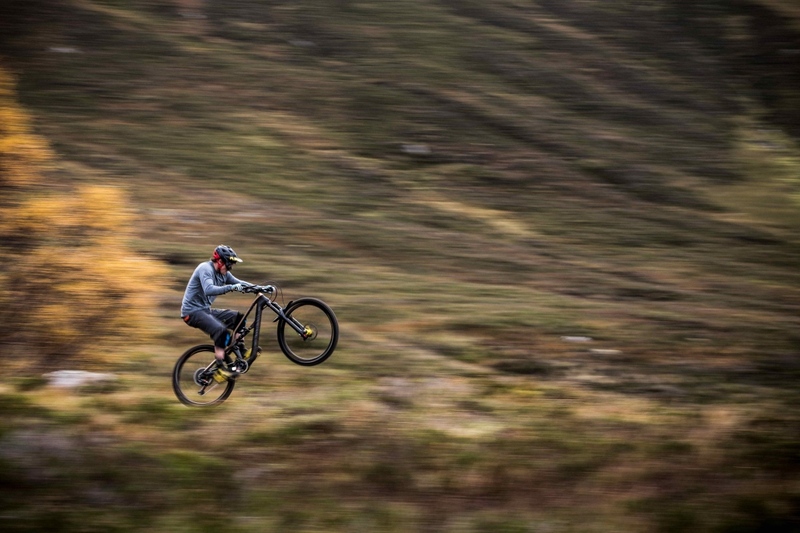 Check out Mtbr’s 4.5-out-of-5 stars review of the outgoing Canyon Spectral. 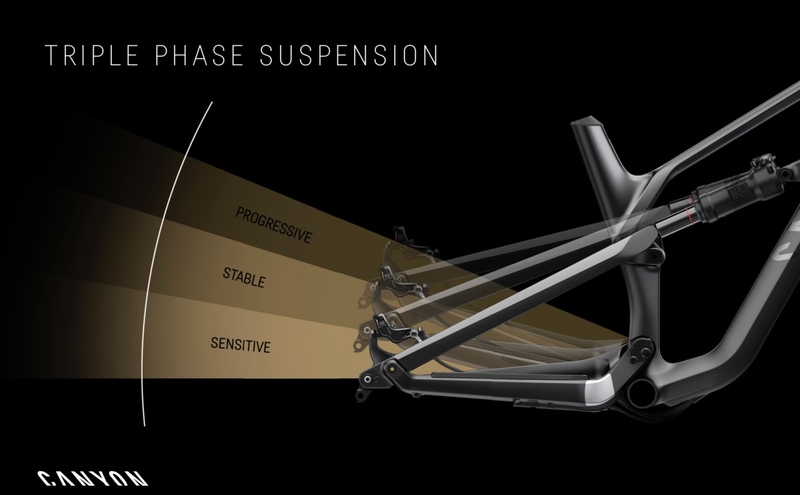 The significant change to the bike’s Horst-link design includes the re-orientation of the shock position, which now runs horizontally between the downtube and seatstays. This move away from a vertical orientation was done with top-end suspension stroke performance in mind, but not at the expense of anti-squat. The end result, claims Canyon, is a bike that pedals well and has a plush and progressive suspension curve that’s not overly harsh at the end. The change in shock position also reduced standover height and allows for dropper posts with up to 150mm in travel. The outgoing model topped out at 125mm droppers. 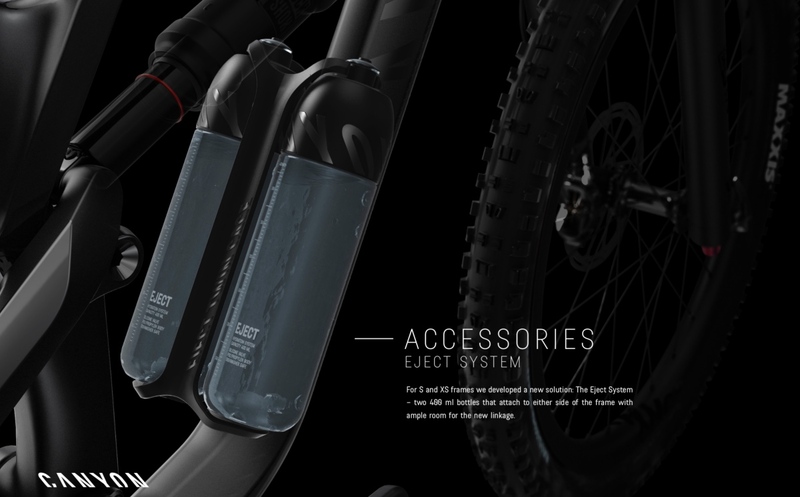 This change in shock position also forced Canyon to get creative with bottle cage placement and design. Indeed, it developed two new cage systems to work with the new lateral position of the shock, as well as a storage box that easily attaches within the frame. 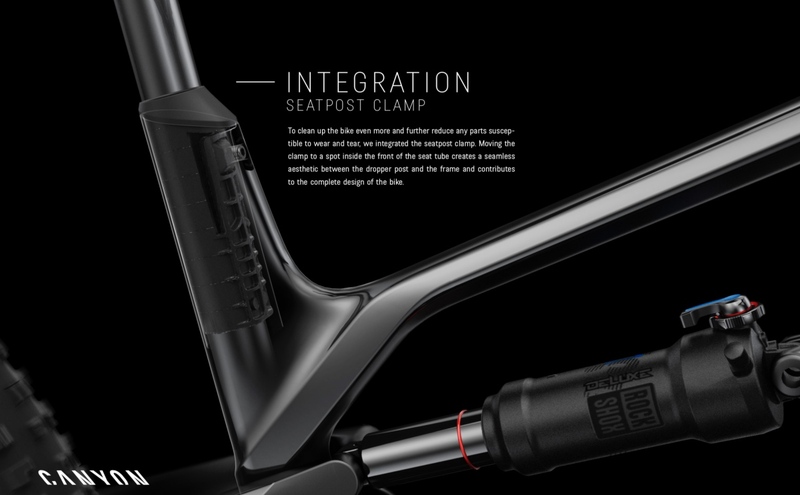 And by integrating the seatpost clamp and introducing a new sealed bearing concept, Canyon has placed special emphasis on weatherproofing and longevity. 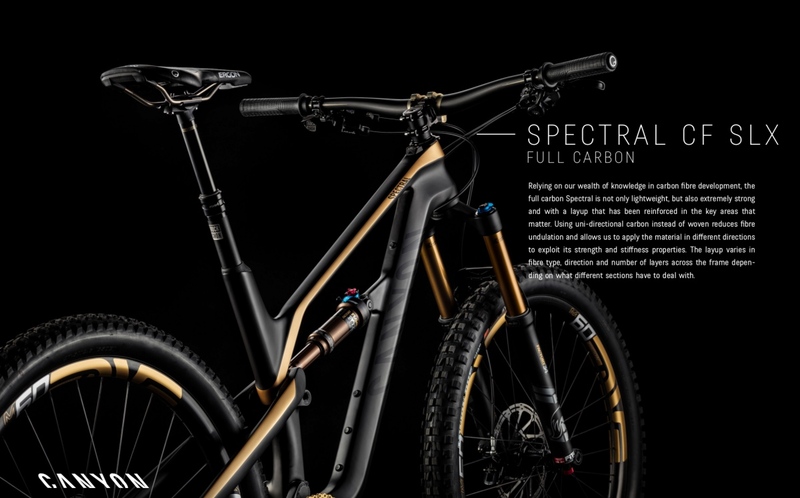 The new Spectral is available in three versions, full carbon, carbon front and aluminium rear, and full aluminium, with each version featuring a new integrated (but not fully internal) cable channel, where an impact-resistant plastic cover integrates into the frame to maintain a clean look that keeps cables safe and silent, while also making service simpler than ever. 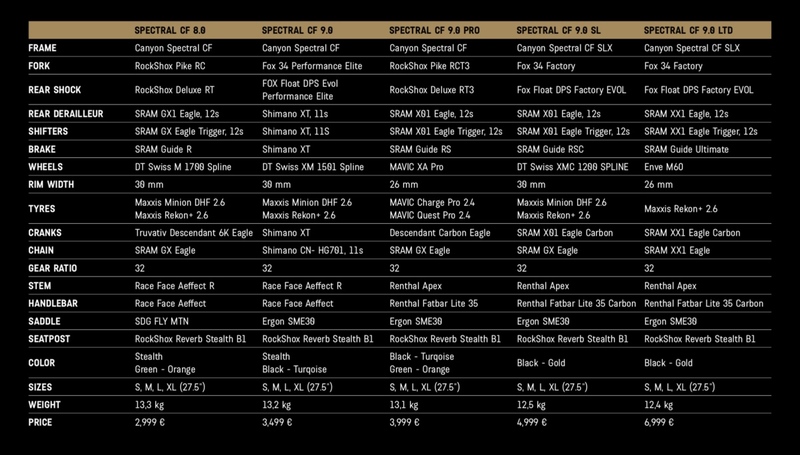 Pricing for the five US models with be as follows: Spectral AL 6.0 – $2499; Spectral CF 8.0 – $3499; Spectral CF 9.0 PRO $4499; Spectral CF 9.0 SL – $5999; and Spectral CF 9.0 EX LTD – $6999. 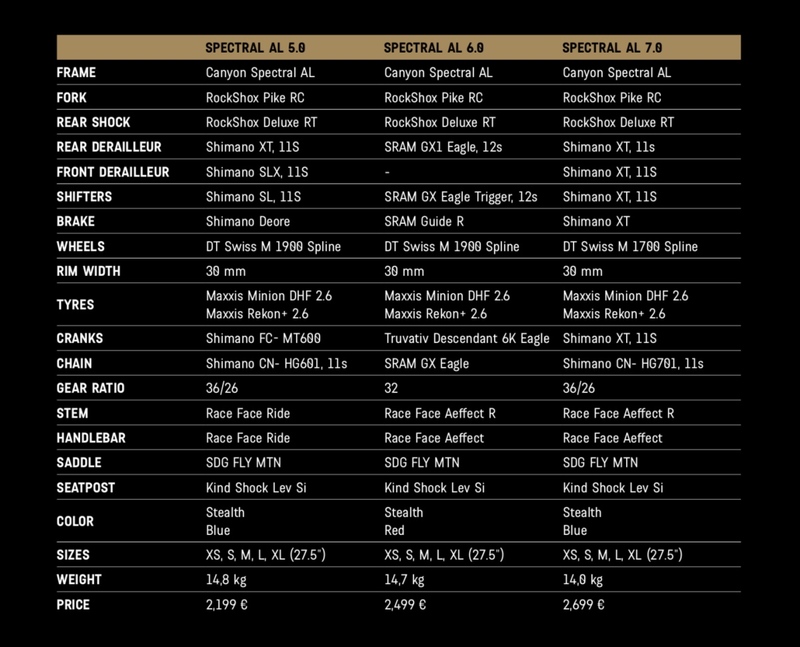 Click on the image below to see corresponding component spec of each of these models. As you’ll see, you get some serious bang for buck here. Click on image to enlarge. 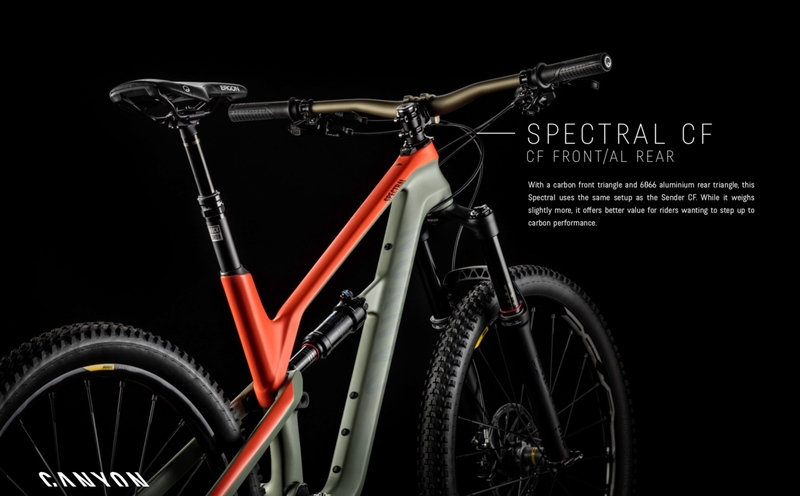 The new Spectral will be available direct to consumer in the US in early 2018. For more information go to www.canyon.com. 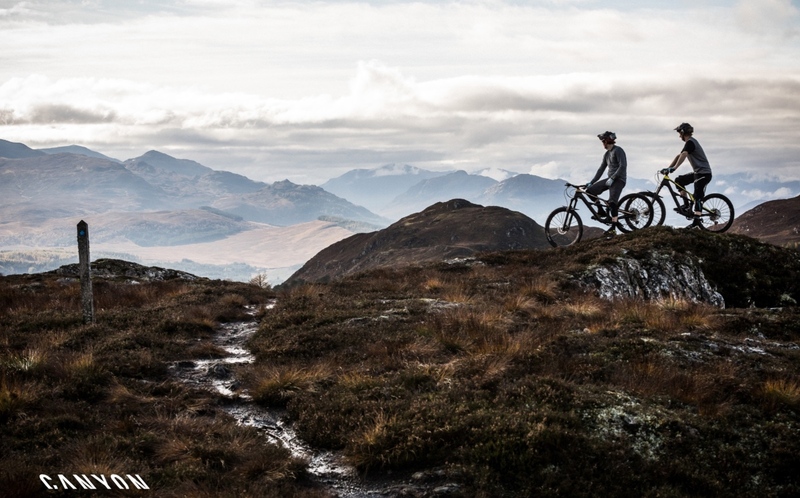 The new bike is first and foremost designed to be fun and playful. The top end Canyon Spectral CF SLX has a carbon frame front and rear. 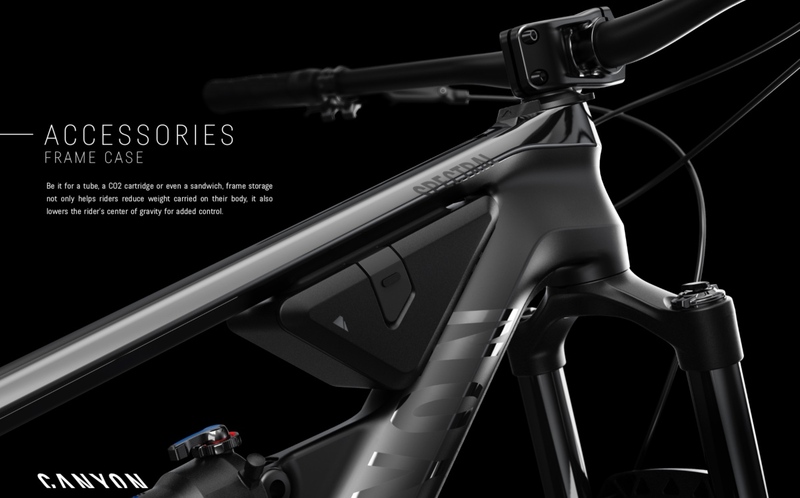 The Canyon Spectral CF utilizes a carbon front triangle mated to an alloy rear. 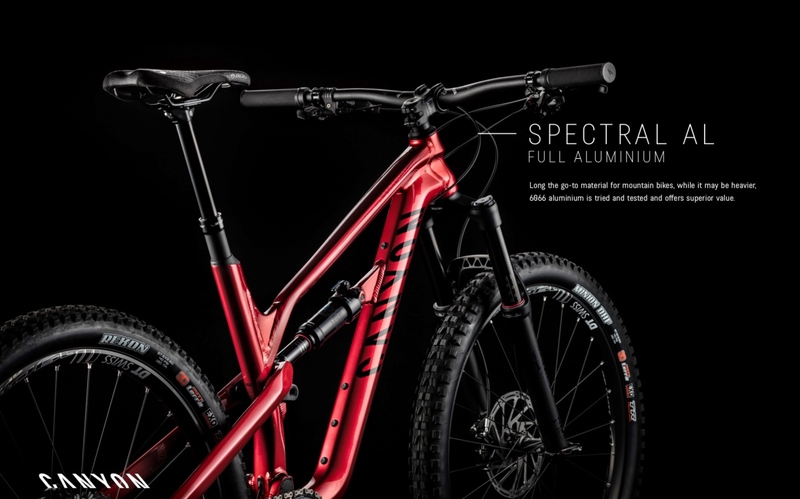 For riders on a tighter budget, the aluminum Canyon Spectral AL will be worth a long look. The redesigned suspension layout seeks to deliver the holy trinity of performance characteristics. A revised bearing design is aimed at improving durability. 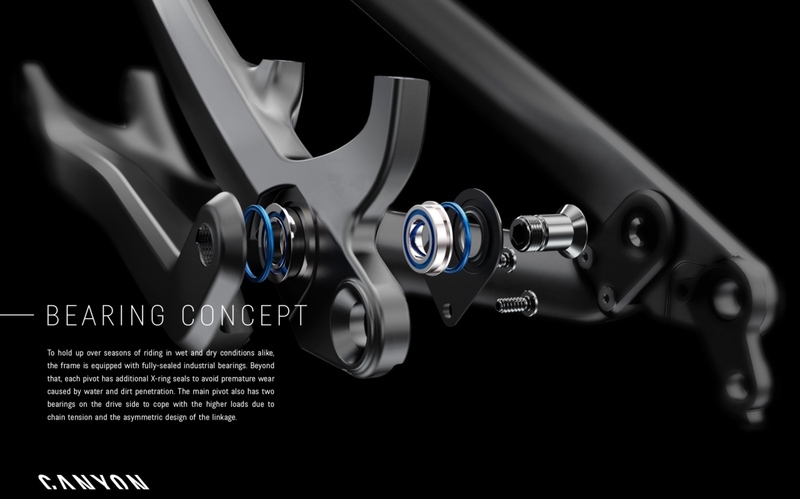 To further reduce the chance of weather-related durability issues, and clean up the bike’s overall aesthetics, Canyon is using a unique integrated seatpost clamp. This bike has no problem getting its front end off the ground. Taking a page from the Specialized playbook, Canyon has incorporated an integrated storage unit into the frame. The impact protection unit (or IPU) keeps the frame from being damaged by the handlebars via a built-in limit stop. 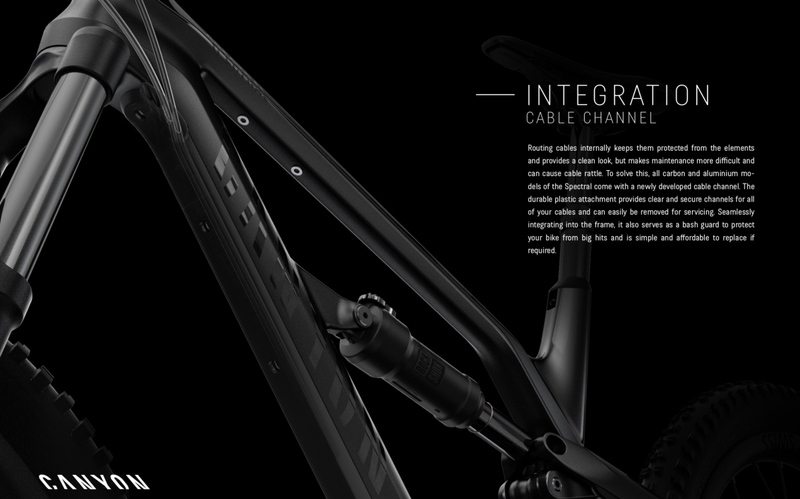 Not internal or external, instead the bike’s cables and housing reside in a cable channel that’s encased by a removable plastic cover. The change in shock orientation created challenges for bottle cage placement. Size M, L, and XL frames come stock with this side-loader cage. For the XS and S framnes they had to get more creative, utilizing a pair of mini-bottles (400ml) that attach to either side of the frame. I am completely baffled by this as well. I would have ordered the 9.0 pro if it had the wider rims, but as it stands I will be getting the lower end CF 8.0. I will be missing out on top end suspension and some carbon goodies, but will get the stiffer fork (compared to fox 34) and wide rims that I need. It seems such a strange choice to go with 25mm rims on the RS 9.0 model. Just to point out, this is not Horst link suspension. A key part of the old Horst link patent was that the chain stay pivot was below the rear axle. This one is above the rear axle. 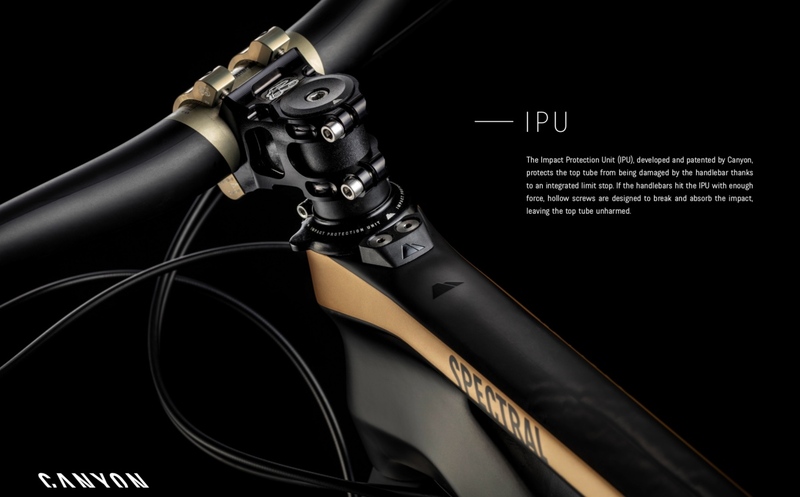 It is actually a ‘Smooth link’ suspension (AKA Rocky Mountain’s suspension that avoided the Horst link patent that was on all of their bikes until recently when they switched to cartridge bearing pivots and true Horst links after the patent expired). They still use it on the Thunderbolt. Curious, but placing the chainstay pivot above or below the real axle, does that have any dramatic change on the kinematics? Intuitively, I don’t think so. Linkage back to the front triangle and shock placement would have a much larger impact.